This Italian bread is full of fantastic flavors. 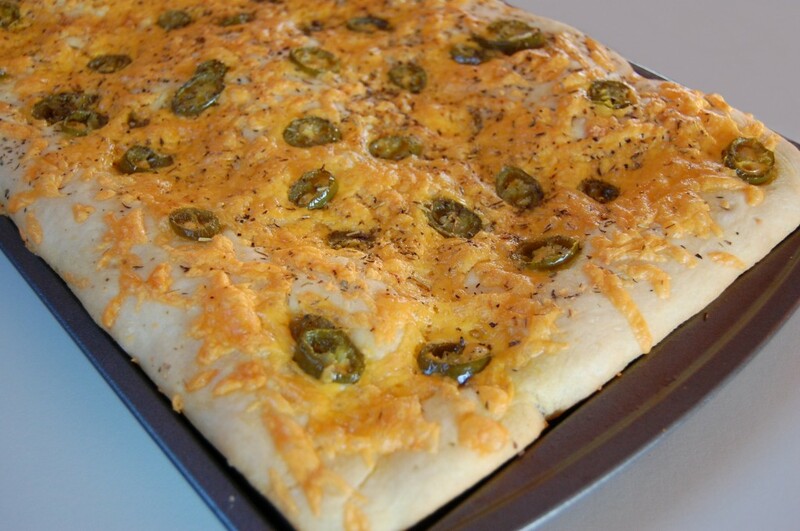 Topped with jalapenos and cheddar cheese. Crispy on the outside, chewy on the inside. Great for sandwiches! In a large mixing bowl, dissolve yeast in warm water; stir in salt. Slowly add 1 cup flour, stir until thoroughly mixed. Gradually add remaining flour, add enough flour, just until dough begins to form a ball and pulls away from side of bowl. Knead on a lightly floured surface until dough is smooth and elastic. Place dough in a bowl greased with olive oil. Cover bowl and let rise in a warm place (about 80 degrees) until doubled in size, about 40 minutes. Generously grease a 10x15-inch jelly-roll pan with 2 tablespoons olive oil. Punch down dough and roll out about 1/2-inch thick. Transfer dough to pan and pat out to pan edges. Using fingers, firmly press the cheddar cheese and jalapenos into dough. Brush with remaining olive oil and sprinkle with herbs. Rise again, about 15 minutes. Preheat oven to 400 degrees. 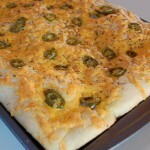 Bake in the lower third of oven for 20 to 25 minutes or until edges of crust are well browned. Cut into 4-inch squares; serve hot.